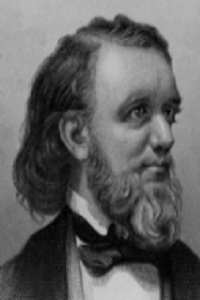 Thomas Bangs Thorpe (March 1, 1815—September 20, 1878) was a painter, journalist, longtime resident of Louisiana and contributed thousands of pages to nineteenth-century periodicals, but is remembered today for a single story, “The Big Bear of Arkansas.” Thorpe was born in Massachusetts and spent his youth in New York. He attended Wesleyan University in Connecticut (1834-35) and studied art and painting. Thorpe suffered from chronic Bright’s disease and moved to Baton Rouge, Louisiana along with several of his Southern classmates. He lived in Baton Rouge for twenty years painting portraits of Southern aristocrats and working as an editor and a journalist. In 1839, Thorpe’s first story, “Tom Owen, the Bee-Hunter,” was published in Spirit of the Times, the journal where several Southwestern humorists began. He retained his loyalty to his northern roots, publishing an anti-slavery novel, The Master’s House: A Tale of Southern Life, in 1854. Thorpe also served as a Colonel in the Union Army. Many of his stories were collected in The Mysteries of the Backwoods (1846) and translated into French, German and Italian. Thorpe later published a revised version of his stories in The Hive of the Beehunter (1854). “The Big Bear of Arkansas” had great popularity in its day. This story gives definitive treatment to a tall tale that long fascinated American readers, and in the twentieth century would provide the occasion for William Faulkner’s great mythic, nature story, “The Bear,” though Thomas Bangs Thorpe’s approach is considerably more comic.